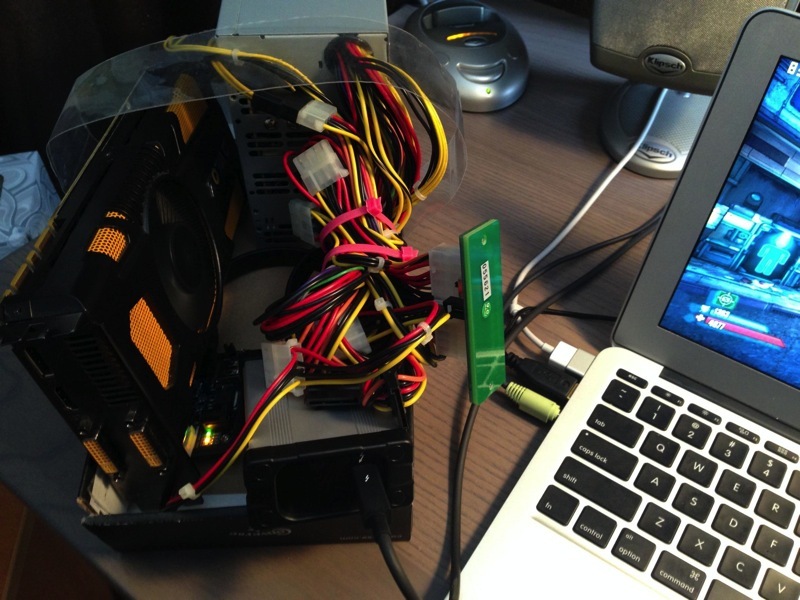 Larry Gadea, a user on the Tech Inferno forums, has shown off a unique setup whereby he connects a graphics card to the 11" MacBook Air via a series of adapters. The full article goes deep into frame rates and benchmarking a variety of games, noting that -- though users need to use Boot Camp to run Windows because of graphics card driver requirements -- advanced PC gaming on the MacBook Air is workable with a little technical know-how. Because his setup can be easily unplugged, it is especially useful for gamers who want to play games on a desktop-screen but still have a lightweight notebook for traveling. It could also conceivably be used on other Thunderbolt-equipped Macs, including the iMac and the upcoming Mac Pro. Apple could make a polished solution, something like Sony did with the Vaio Z. The Vaio Z was thinner and half a pound lighter than an MacBook Air, but had full voltage processors (up to quad core i7) like a Pro. The external case isn't just for the Blu-Ray reader/writer – it also housed a AMD graphics card. This is what I imagined would be done when the 2011's introduced Thunderbolt. it's a perfect use for it. Allowing your average performing laptop to have average performing graphcis capabilities while docked, leveraging the Thunderbolt bandwith. The fact that its' taken years to come to fruition is a bit sad, and I feel Apple has completely missed the boat with leveraging thunderbolt. Right now, it's effectively just a interconnect being used for drive arrays, but it's capable of so so so much more. I read "Lady Gaga, a user on the Tech Inferno...."
An "excellent gaming experience" is not looking down on an 11" display! This goes against the whole point of a MacBook Air. Someone who buys an MBA in the first place is presumably wanting portable productivity. They are probably not looking to do this type of high-end gaming on it. However, yes, in a portable enclosure, this can be pretty neat. I'm glad someone got it to work, but i mean...why bother? I just dropped a $170 GTX 650 Ti Boost into my old 2008 Mac Pro, and it's way more than twice as fast as this frankenair. This is great as a "can it be done" experiment, but it isn't a "solution" by any means. It would probably be less annoying to carry around a mac pro and a monitor than to carry around all of those cables and adapters and such in the name of mobile gaming. I'm surprised by how many people are completely missing the point of a setup like this. If you hadn't noticed, Thunderbolt is not a permanent physical connection. When you're at home at your desk, plug in the video card and do some gaming. Then when you're done, unplug, pick up your ultrabook in one hand, walk around, and feel free to plop it in an airplane or lecture hall seat tray for your productivity. Can you do that with an old Mac Pro? I thought it was the original plan too with the Mac Pro and its expandability using its thunderbolt ports. You are right, but as you said ... having the option of potentially gaming with insane frame-rates when you want to, this would be incredible if Apple could do something like this. Imagine it: a super sleek, thin laptop with amazing battery life. Then if you want to have a nice little LAN party, carry along a small caddy as well, and you're fragging in Ultra quality at 60fps. I would love if Apple did this. It would be an insta-buy for me, no question about it. So, how about a 27" LED Display with a Titan card built in...? get used to that general tangle of wires and adaptors when you get your new Mac Pro!